Various ethnomedicinal uses such as diarrhoea, dysentery, cough, wound healing, skin diseases, burns and gastric disorder of stem bark, seed, fruit and twig have been reported.,,,, Paste of its leaves is applied externally on swellings. It is also reported that the ethyl alcohol extract of aerial parts has diuretic and cardiovascular stimulant potential. The seeds possess haemagglutinating properties against the human A, B and O red cells., Some communities use this multipurpose plant for its fodder, timber and fuel wood. Phytochemical investigations revealed the presence of alkaloid and phenolic compounds such as lignins and tannins., A polyphenolic flavonoid compound isolated, viz. 5, 7, 3′,4′,5′-pentahydroxy dihdroflavanol-3-O-(2″-O-galloyl)-β-D-glucopyranoside, was tested for its neuroprotective effect in transient focal cerebral ischemia in rats and found to be a good neuroprotective agent in stroke as it reduced apoptosis and found to have good antioxidant and anti-inflammatory potential. Based upon the ethnomedicinal importance of Anogeissus pendula, we have evaluated the pharmacognostic parameters for the first time which will help in the quality control of the herbal formulations containing the same and also to help the preparation of a herbal monograph of the plant in the near future. The marker compounds Rutin and Quercetin were procured from Hi-Media laboratories. All the other chemicals used were of analytical grade and were procured from Merck & Co. Inc., Hi-Media laboratories, Sigma-Aldrich and Qualikems Fine Chemical Pvt. ltd. The microscope used to study different microscopic characters was Olympus CX 41. Fresh leaves and stem bark were collected from Sawai Madhopur (Rajasthan) in the month of November. The plant was identified and authenticated. Collected plant parts were shade dried and powdered coarsely. Standard procedure and analytical grade solvents were used for the extraction. 40 g of plant parts' powder (leaf and stem bark) was preliminary extracted with chloroform and n-hexane, respectively by Soxhlet apparatus and further with the same procedure extracted with hydroalcoholic solution. Obtained extracts were concentrated under reduced pressure and freeze-dried to get yield of 20.1% (leaf – Anogeissus pendula leaf [APL]) and 9. 2% (stem bark – Anogeissus pendula bark [APB]). Extracts were stored in sealed vials in a freezer until tested. Fresh plant parts were tested for various sensory parameters such as colour, odour, size, shape and taste. Various macroscopic parameters of fresh leaves such as surface appearance, texture and characters of lamina were recorded. Lamina consists of various distinctive features such as shape, margin, incision, composition, apex, base and venation. Stem bark was studied for various morphological characters such as nature of curvature, surface characteristics and fracture. For microscopic evaluation, fresh leaves and stem bark were fixed in fixing solution (FA solution containing formalin (5 ml), glacial acetic acid (5 ml) and 70% alcohol (90 ml)) for three days before chloral hydrate solution treatment. Microscopic evaluation was carried out at both levels qualitatively and quantitatively. For qualitative microscopy of leaf and stem bark, a cube of pith was used and fine sections were obtained. 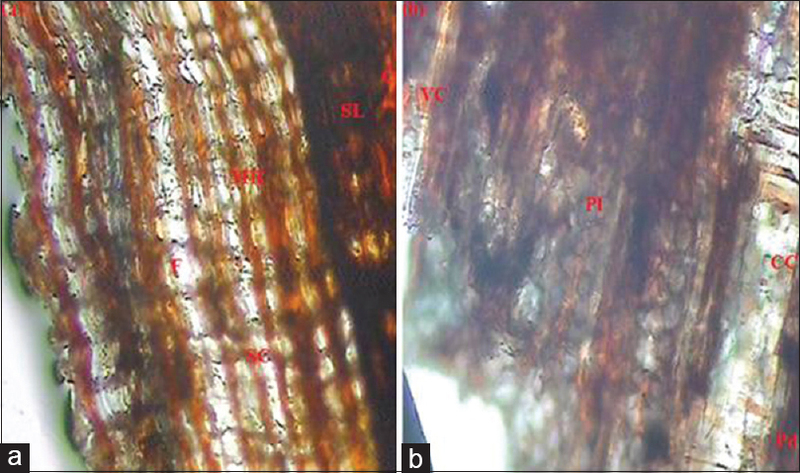 Transverse sections of stem bark and leaf as well as longitudinal section of stem bark were studied under microscope. 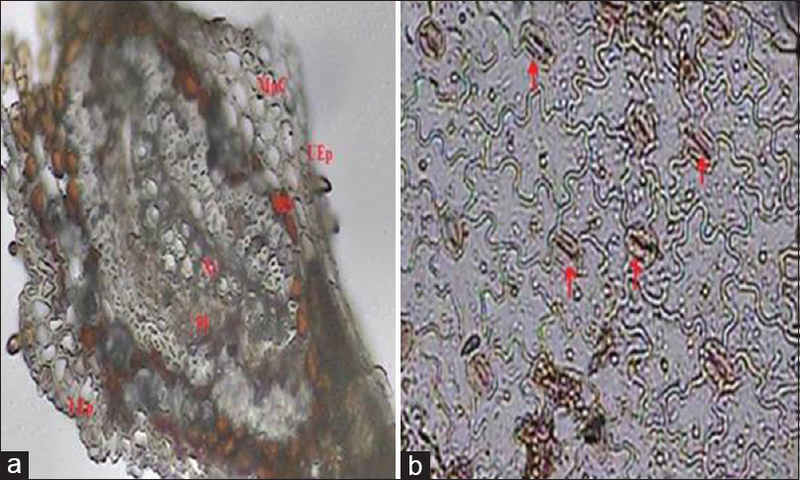 The various characteristic features of unstained sections of stem bark and leaf were studied under microscope and photomicrography was done subsequently. In quantitative microscopy, fresh leaves were used and leaf constants such as stomata number, stomatal index, vein-islet number and vein termination number were studied. In this study, air dried plant material was used for quantitative determination of physicochemical values such as total ash, acid insoluble ash, water soluble ash, moisture content (loss on drying), foaming index, swelling index, crude fibre, total solid, alcohol extractive value and water extractive value as per standard methods. Phytochemical investigation of hydroalcoholic extracts of leaves and stem bark was carried out according to standard procedure. HPLC method was developed for Rutin analysis and the following conditions were followed. Analysis was done on LC100 Cyberlab HPLC using Agilent technologies C-18 column with dimensions of 250 × 4.6 mm. HPLC software was Chrom-Workstation HPLC with version number 4-0512-039. Run time for marker compound (Rutin) was 10 minutes and for extracts was 60 minutes. Injection volume was 20μl. Temperature was ambient. Mobile phase and solvents used were sonicated and passed through 0.45μ nylon filter using vacuum pump. Flow rate of mobile phase was kept at 0.8 ml/min. Mobile phase consisted of acetonitrile and 2% acetic acid (v/v) at the ratio of 95:5. Wavelength for analysis was chosen using Shimadzu UV-1800 spectrophotometer and selected as 370 nm. HPTLC was performed using a previously used method with some modifications. HPTLC was of CAMAG Linomat 5 “Linomat 5_180745” S/N 180745. Silica gel 60 F 254 HPTLC plates measuring 12 cm × 10 cm manufactured by Merck were used. Software used for HPTLC was WinCATS Planar chromatography manager. CAMAG TLC Scanner “Scanner_180710” S/N 180710 was used for HPTLC analysis. Slit dimensions were 5.00 mm × 0.30 mm. Distance between tracks was 18.0 mm. Scanning speed was 20 mm/s. Dosage speed was 150 nl/s. Predosage volume was 0.2 μl. Band length was set at 10.0 mm. Mobile phase consisted of ethyl acetate: glacial acetic acid: formic acid: water in the ratio of 20:1:1:2.5. Wavelength of HPTLC analysis was set at 254 nm. Leaves were small, narrowed at both ends with petiole 1-2 mm long [Figure 1]. They were arranged in opposite pairs. The organoleptic characters of leaves include dark green colour of upper surface and light green colour of lower surface. Leaves had characteristic odour and taste with short appressed hairs above and beneath. Stem bark was rough in appearance and outer surface of ash or grey white colour while the inner surface of faint yellow colour which on exposure to atmosphere turns brown. Stem bark had characteristic odour and with bitter taste. The morphological characters of leaves were observed as size of 1.5 – 3.1 cm × 0.5 – 1.5 cm. The lamina characters include the shape which was found to be oblanceolate to obovate, entire margin, incision was absent, lamina composition was simple, obtuse to acute apex, cuneate base. The venation was reticulate. Type of arrangement was dorsiventral. On the lower surface there were 5-7 nerves which were ascending and slightly raised. Stem bark had fibrous fracture and variable nature of curvature. The upper and lower epidermis that is adaxial and abaxial surface respectively, was made up of multiple layers of compactly arranged cells [Figure 2]a. All the epidermal cells were alike and highly cutinized. The stomata were sunken as they were located in a cup shaped depression. Anomocytic type of stomata was found in the leaves [Figure 2]b. Mesophyll was composed of thin walled parenchymatous cells containing numerous chloroplasts. It was differentiated into palisade and spongy parenchyma. The columnar (tubular or cylindrical) palisade cells were arranged compactly with their long axis at right angles to the leaf epidermis. The spongy parenchyma cells were of irregular shape and loosely arranged with large intercellular spaces. These air spaces were connected with the sub-stomatal chamber and maintain gas exchange with the outside through stomata. Adaxial surface was occupied by palisade parenchyma while the abaxial surface was occupied by spongy parenchyma. Veins can be differentiated into a number of size classes and orders. The vein of primary order was thickest and single, occupying median position. Vein further ramified into venules of secondary order that were slightly thinner than the primary vein. The venules further ramified to give rise to veinlets of tertiary order that were the thinnest. The midrib consisted of a typical collateral bundle with an adaxial xylem and abaxial phloem. A thin strip of cambium was also present between xylem and phloem. The vascular tissue of midvein and larger veins had vessels in the xylem and sieve tube in phloem. In smaller veins the xylem was represented by tracheids and the phloem by some sieve elements only. A morphologically distinct group of cells surrounded the vascular bundles called bundle sheath which were thin walled parenchymatous cells extending in the direction parallel to the veins. The parenchymatous bundle sheath extended upto the epidermis on one or both sides of the leaf. It probably plays an important role in the conduction of food material between the vascular bundle and epidermis. Leaf constants viz. stomata number, stomatal index, vein-islet number and vein termination number are presented in [Table 1]. Microscopic characteristics of stem bark are depicted in [Figure 3]. Periderm consisted of cork, phellogen and phelloderm. Cork had 5 – 20 layers which were made up of rectangular, thick walled cells having coloured content. Phellogen had shown 2 – 3 layers and was made up of polygonal and tangentially elongated cells. In phelloderm, cells resembled cells of cortex and were isodiametric with intercellular spaces which were arranged in definite radial rows. Lenticels were also present. Secondary cortex was composed of oval to polygonal cells arranged in 10-15 layers. Secondary phloem was parenchymatous having phloem fibres and sclereids. The cells in secondary phloem were arranged in two systems that were vertical (sieve tubes, companion cells, phloem parenchyma and fibres) and horizontal (ray parenchyma cells formed by the ray initials). Physicochemical analysis of stem bark and leaf powder viz. 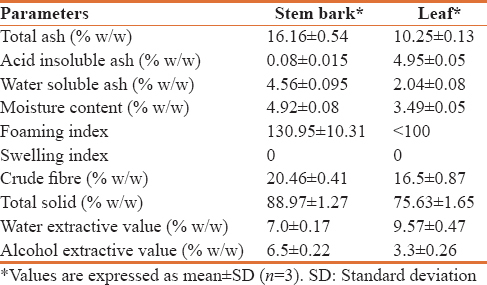 total ash, acid insoluble ash, water soluble ash, moisture content, foaming index, swelling index, crude fibre, total solid alcohol extractive value and water extractive value are presented in [Table 2]. Preliminary qualitative phytochemical screening revealed the presence of alkaloids, flavonoids, tannins and phenols in both APB and APL. 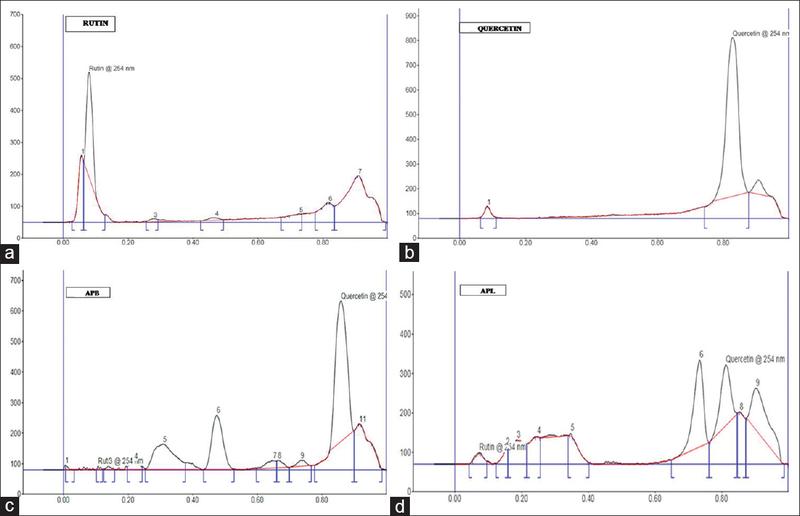 APB gave retention time for Rutin at 4.05 minutes [Figure 4] while APL gave retention time at 4.10 minutes in respect of marker compound Rutin whose retention time was 4.08 minutes. Concentration of Rutin was found to be 9.97% w/w in APB and 6.23% w/w in APL. Quercetin and Rutin concentration was found to be 51.62 and 8.1% w/w in APB whereas 27.29 and 4.40% w/w in APL. Rf for marker compound of Rutin was found to be between 0.06 and 0.13 whereas for marker compound of Quercetin was between 0.74 and 0.88. In case of APB Rf for Rutin was found to be between 0.10 and 0.12 whereas for Quercetin 0.78 and 0.90 while in case of APL it was found to be between 0.04 and 0.10 for Rutin while for Quercetin it was between 0.76 and 0.85. 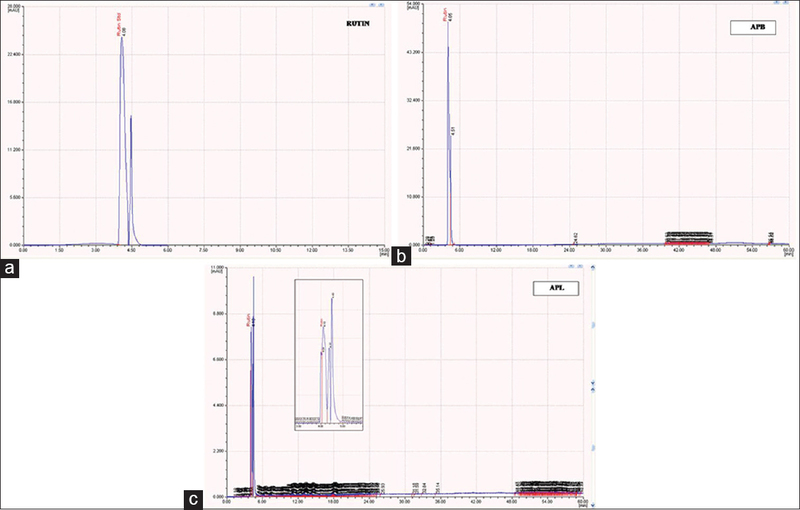 HPTLC chromatograms of Quercetin, Rutin, APB and APL are shown in [Figure 5]. In physicochemical parameters, ash values and extractive values serve as a reliable aid for detecting adulteration and in identification of plant. Ash values give an idea about inorganic composition or earthy matter or other impurities present along with the drug while extractive values are useful for the determination of exhausted and adulterated drug. Extractive value also helps in indication of chemical constituents and in estimation of specific constituents soluble in particular solvents in a crude drug., Crude fibre content indicates the amount of cellulose, lignin and cork cell. Moisture content below 6% w/w indicates that the crude drug can be stored safely. Foaming index gives an idea about the presence of saponins. Swelling index shows the presence of mucilage. In the present study, the various pharmacognostic parameters such as organoleptic, macroscopic, microscopic, physicochemical and chromatographic fingerprinting have been recorded and those will aid in the quality control and quality assurance of the plant. Anogeissus pendula has dorsiventral oblanceolate to obovate leaves arranged in opposite pairs while the stem bark has rough appearance and ash to grey white in colour. Microscopy reveals that the leaves have anomocytic type of stomata. The characteristic microscopic features of leaves were observed as epidermal cells, palisade and spongy parenchyma, vascular bundles, xylem and phloem cells. The columnar (tubular or cylindrical) palisade cells were arranged compactly with their long axis at right angles to the leaf epidermis. This arrangement of palisade cells protects chloroplasts from excessive heat of sun rays. Stem bark microscopy revealed the presence of periderm (cork, phellogen and phelloderm), lenticels, secondary cortex, secondary phloem (sieve tubes, companion cells, phloem parenchyma, fibres, ray parenchyma cells). 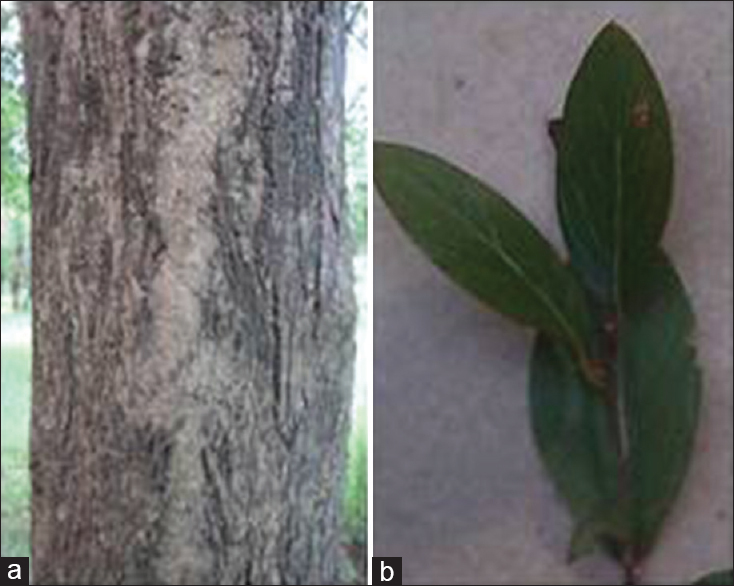 Physicochemical evaluation shows that the total ash is higher in stem bark than the leaves and same results replicate in case of water soluble ash but the acid insoluble ash is higher in leaves. Moisture content is below 6% w/w for both stem bark and leaves and therefore they can be stored safely. Foaming index reveals very low quantity of saponins but higher in bark than leaves. Both the extracts of plant parts showed higher water extractive value than alcohol extractive value. Chromatographic fingerprinting supports the findings of preliminary phytochemical evaluation and reveals the presence of flavonoids such as Rutin and Quercetin in both the extracts but APB that is hydroalcoholic extract of stem bark, has more quantity of active phytochemicals than the APL. In conclusion, the parameters which are evaluated here can be considered as unique enough to identify and decide the authenticity of A. pendula which will serve in the development of pharmacopoeial standards for future studies. Authors are thankful to Dr. Krishnendra Singh Nama and Dr. Kiran Chaudhary, Botanist, Maa Bharti P. G. College, Kota for the identification, collection and authentication of the plant. Krishen P. Jungle Trees of Central India. India: Penguin Books; 2014. Singh V, Parmar PJ, Pandey RP. Flora of Rajasthan. Howrah, India: Botanical Survey of India; 1993. Lata S. Polycyclic Phenolics of Ficus Glomerata and Anogeissus pendula and their Effects on Some Bovine Rumen Enzymes. Ph. D. Thesis, Bundelkhand University, Jhansi, India; 2008. Mishra A. Study on some ethnomedicinal plants of Kalinjar hillock, Banda district (U.P.) India. Int J Adv Res Eng Appl Sci 2015;4:1-9. Ray S, Sheikh M, Mishra S. Ethnomedicinal plants used by tribals of East Nimar region, Madhya Pradesh. Indian J Trad Knowl 2011;10:367-71. Sikarwar RL, Pathak B, Jaiswal A. Some unique ethnomedicinal perceptions of tribal communities of Chitrakoot, Madhya Pradesh. Indian J Trad Knowl 2008;7:613-17. Vardhana R. Direct Uses of Medicinal Plants and their Identification. India: Sarup & Sons; 2008. Pullaiah T. Encyclopaedia of World Medicinal Plants. India: Daya Books; 2006. The Wealth of India. National Institute of Science Communication and Information Resources. New Delhi, India: Council of Scientific and Industrial Research; 2003. Hungund BL, Pathak CH. A Survey of Plants in Gujarat, India, for Alkaloids, Saponins, and Tannins. NE-201. Asheville, North Carolina: Forest Service - U. S. Department of Agriculture, Southeastern Forest Experiment Station; 1971. p. 1-11. Khandelwal KR. Practical Pharmacognosy Techniques and Experiments. Nirali Prakashan, Pune, India; 2010. Sajeeth CI, Manna PK, Manavalan R, Jolly CI. Quantitative estimation of gallic acid, rutin and quercetin in certain herbal plants by HPTLC method. Der Chem Sin 2010;1:80-5. Gupta PC, Sharma N, Rao CV. Pharmacognostic studies of the leaves and stem of Careya arborea Roxb. Asian Pac J Trop Biomed 2012;2:404-8. Kumar D, Kumar A, Prakash O. Pharmacognostic evaluation of stem bark of Pongamia pinnata (L.) pierre. Asian Pac J Trop Biomed 2012;2:S543-6. Chinmay R, Kumari S, Dhar B, Mohanty RC, Dixit R, Padhi MM, et al. Phyto-Pharmacognostical studies of two endangered species of Malaxis (Jeevak and Rishibhak). Pharmacogn J 2011;3:77-85. Thomas S, Patil DA, Patil AG, Chandra N. Pharmacognostic evaluation and physicochemical analysis of Averrhoa carambola L. fruit. J Herb Toxicol 2008;2:51-4.